No clue what I’m doing here. You? I got some advice from Herbert for things to do around Cajamarca during the course of the following day. The idea was to go to Otuzco, then take a walk to Baños del Inca, go to the terms and, from there, take a bus to Polloc. I arrived in Otuzco without too much of a problem. But it’s always a strange feeling to arrive in these small villages. Maybe it’s just in my head but, because you feel so very different and out of context, you think people are looking at you all the time. And you don’t feel 100% at ease. Especially as I didn’t quite know what there was to see in the village. And I found it a bit odd to ask the locals how to get to a place the name of which I didn’t know. Neither what it was: a house? A church? A park? A road? A statue? A memorial? – Good day, madam. I was told there was something to see in this village but I don’t know exactly what it is. Could you help me finding out what it is and how to get there? Happens the place to be was a cemetery, known as “las ventanillas de Otuzco”. Damn it. I love cemeteries. This one being rather special, as it is made of holes carved in a big stone, in which they placed the dead. But I left the village without having seen the little windows. I had a nice walk to Baños del Inca. I had to ask for the way once or twice but, at least, I knew where I was heading to. As everywhere in South America, there were a lot of dogs along the way. They always bark a lot but I learned to ignore them, which usually works quite well. That day I was less lucky. I was so busy ignoring the dogs and doing so well at it that I didn’t see one of them rushing towards me and heading for my ankle. Fortunately, my shoes did a good job protecting me from the fangs. He did not insist and I just kept on walking as if nothing had happened. It was obvious, there and everywhere else in the country, that there had been elections not so long ago. 90 percent of the houses were covered, not so much with slogans and photographs, but mainly with a painted icon which represents the candidate and the party. I guess because something very visual is easier to recognize on a voting paper. Whenever I would see some new paintings, I couldn’t stop but think about the fact that they would need to make everything disappear under a new layer… and then paint them again with the next elections. Remains of the elections that took place only a few weeks ago. Towards the end of the walk, I had a funny sight of a lady walking around with her cow. The cow on the side walk. And the lady on the street. Why should everything always be that damn conventional after all? If I’m walking on the side walk, why shouldn’t the cow? 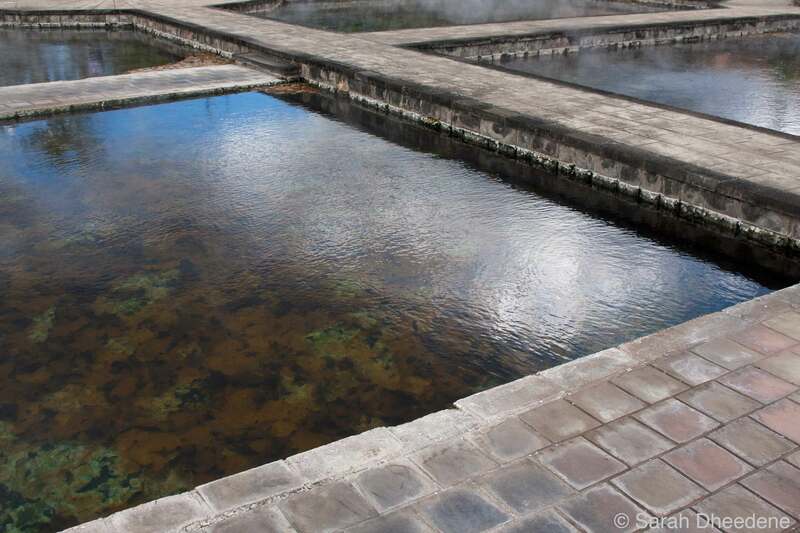 The terms in Baños del Inca were nice. As it was a private bathroom just for me, it really felt like taking a bath. But then with naturally hot and healthy water, which was most welcome, as only a cold shower was available in Herbert’s studio, where I was sleeping. Knowing that the Inca emperor used to come there made it kind of classy to just be there. Outside basins at the therms. So I left all clean to go to Polloc, the last halt of the day before returning to Cajamarca. At first sight, just another small village. But if you go through it, just outside what I guess was the centre – but where exactly is the centre of a village which is only 4 or 5 streets big? – there is a church. Of course, one might wonder why it is necessary to go to a tiny little village deep down in the Peruvian countryside to see a church… and the truth is I hadn’t seen anything like it before. All covered up with mosaic. It is probably the most colour- and joyful one I have visited in my church-visiting life. I am not a church fanatic but I have seen quite a few. I spent more than an hour taking pictures and managed to get a bus back to Cajamarca before nightfall. The moment I got off the mini-van and was on my way back to the city centre, I bumped into a group of people I had met with Herbert on the previous day. That’s the moment I feel I am becoming popular in a place. 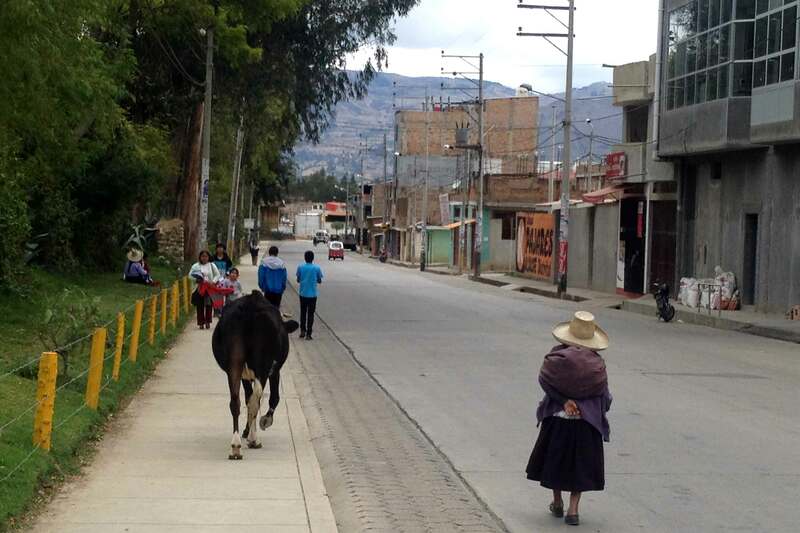 Not that Cajamarca is a very big city… But meeting someone I know, by chance, after only having been around for four days, I would say that’s quite an achievement. I was planning to take a cab back to the Plaza de Armas but I was out of money. So I accepted Luis’ invitation to go on foot. And then the invitation to go and have a drink. That’s one I rarely refuse.